The young unmarried daughters of the upper classes who were debutantes before World War II were the most cocooned members of British society. These girls – economically supported, socially insulated and morally patrolled – found life in wartime both a challenge and an education. All most all responded at once to their country’s peril by joining up (rather than waiting a year or two to be called up). Of the forty-seven on whose stories this book is based, several became nurses or VADs (where they were often given the worst or dirtiest jobs to do), while others opted for factory work, trying–usually unsuccessfully- to disguise their backgrounds. One or two worked at Bletchley Park or became Land Girls, but most went into the Services – as FANYs, ATS, Wrens or WAAFs. They talk in this book about the changes that war brought to their lives, the difficulties of love and marriage and what they did for fun. They describe the culture shock of going from a world where a lady’s maid looked after their clothes to one where being inspected for head lice was routine; and how the class barrier dissolved under the imperatives of love and war – or retained its ancient power. Horrors and tragedy became a commonplace but for all of them the feelings of liberation and self-confidence produced by wartime challenges changed their lives. a glorious yarn a mixture of derring-do, make-do and eye-ppping innocence. 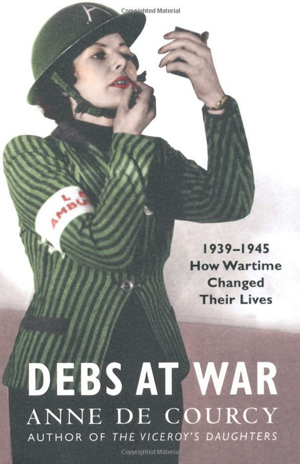 Reading Debs at War means plunging into a world so rich and strange that it comes as a shock to remember it is a mere generation away from our own. …there is something on every page that clamours to be quoted. Reading their story, I was constantly imploring people to “Listen to this!” Sometimes it was funny, sometimes astonishing, often admirable, sometimes touching. A sliver of history pinned down so well by Anne de Courcy. A first-rate piece of social history.